An updated version of Mother Hen, 1.1.0 iOS, has just been released. It is sporting some new features that were specifically requested by your fellow users. 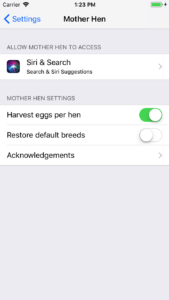 If you have multiple different species of poultry, whether it be a brood of chickens, a gaggle of geese, a covey of quail, or a badling of ducks, you will now be able to record egg production separately. The egg production graph doesn’t yet support this separation, i.e. 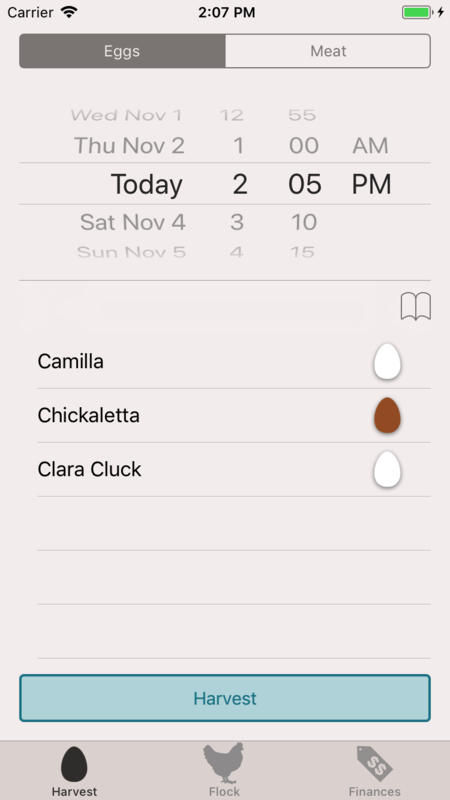 it still groups all eggs on a given day in one count, regardless of species, but the plan is to implement this in a future release. Guineafowl are now available as a species in Mother Hen. Rotate for graph: intuitive or not? I got a black page with dates at the bottom, that scroll. That’s all there is. I read “dates that scroll” and my mind immediately thought that maybe she had somehow gotten a corrupt download from the app store and it was displaying the date spinner on the Harvest Eggs screen in some weird, messed up fashion. So, I started testing every single OS+device combination I could think of, to see if some combination produced this messed-up black screen I was picturing in my head. No luck. Try as I might, I couldn’t get it to mess up like that. Then, as I was sitting there looking at my iPad simulator, it finally dawned on me… it was in landscape mode. She was seeing the chart view, with no data in it yet. She just needed to turn the device. So, that got me thinking. I wonder how intuitive the egg chart is for people? If you haven’t discovered it yet, when you are on the harvest eggs screen (the one that comes up by default, with the big egg on it) and you turn your phone/tablet to the side (landscape orientation) it will display a line chart of the eggs you’ve collected. 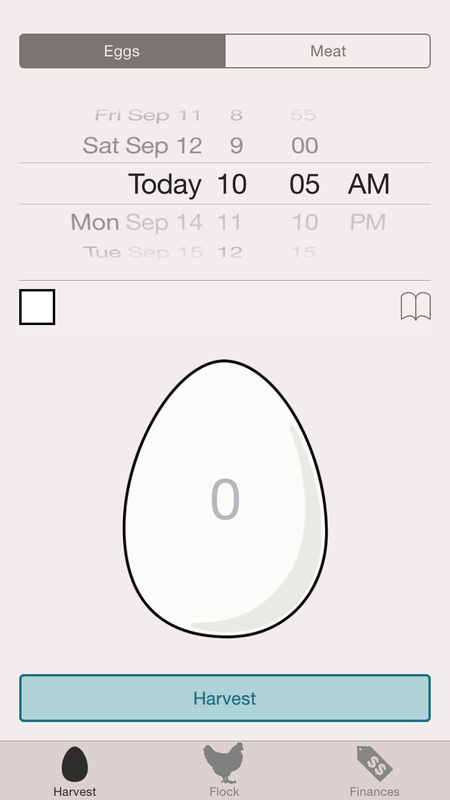 Of course, if you haven’t collected any eggs yet, there won’t be any data to plot on the chart. 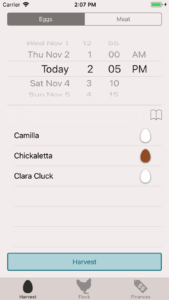 I originally designed it this way because I didn’t want people to have to do a lot of tapping to get in and out of the egg chart; one motion could display it. In addition, the harvest screen and the egg chart are naturally more suited for portrait and landscape orientation respectively. So, rather than try and re-swizzle the harvest egg screen to make it look right when rotated on its side, it displays the chart instead. I also figured that most people would only be interested in a chart after they had collected a few day’s worth of eggs. I mean, the chart isn’t very interesting with almost no data points. It really only becomes interesting when you’ve got a week or more of data. I guess I figured that, over a week’s time, people were bound to turn it either accidentally or intentionally and be pleasantly surprised. Should there be some kind of visual indicator that indicates you can see a different view if you rotate? If so, what would that even look like? Are there any other apps that do something similar? Let me know what you think in the comments. Today, I had the unfortunate realization that Apple doesn’t give developers any ability to contact users that have purchased an app through the App Store; we have to wait for them to reach out to us. I also realized that my old support link, while meeting the bare minimum for launching Mother App on the store, would likely be intimidating to some people. So, between those two things, they provided enough motivation to get this site up and operational. 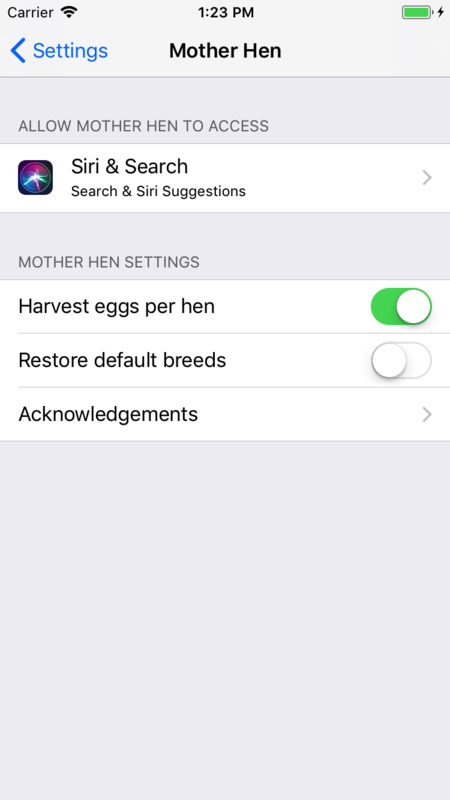 As you might have been able to tell from the description of Mother Hen in the App Store, I’m trying to give our app a little more of a personal connection. I want people to feel like they can make suggestions on things that would make Mother Hen just a little better. The best way to submit bugs or enhancement requests is to use the bug tracker. This allows other users to see bugs and vote for enhancements.